In the broadest sense, stepping back from the project, the J-2X development effort has three primary branches. First, of course, you have our prime contractor, Pratt & Whitney Rocketdyne (PWR) who is responsible for designing the engine and demonstrating that it meets the imposed requirements. Second, you have the team here at NASA responsible for management, technical oversight and insight, and, in a handful of specific cases, mainline work in support of PWR activities. And, third, you have the extensive efforts underway at the NASA Stennis Space Center (SSC) in southern Mississippi to provide a site for testing of the J-2X. If you scroll down a ways through previous articles you’ll see that I wrote an overview article about SSC and the test stands there. Here, for this article, I’m going to provide an update and show off some neato pictures of the ongoing work. The first engine testing will take place on stand A2. 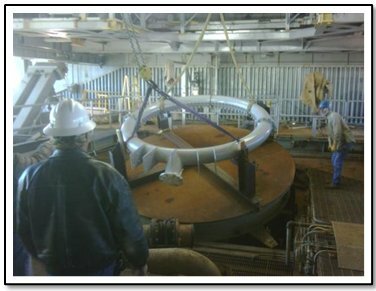 In the picture below, technicians are using a locator tool to properly position the water spray ring to where it will need to be over the diffuser. The water spray ring is used to cool the top portions of the diffuser and is necessary since the first tests of the engine will not have any nozzle extension attached below the regeneratively-cooled nozzle. This means that the exhaust flow will not be entirely ‘turned’ and so it will impinge on the diffuser walls. Next, after getting the spray ring close to the correct position using this tooling, the diffuser will be raised into position below the ring and a laser measurement system will be used to determine the exact location of the spray ring. At that point, the support arms will be installed so as to maintain that position. In order to check out the extensive communications between the test control center, the test stand, and the engine itself, PWR shipped to SSC the first prototype engine controller. 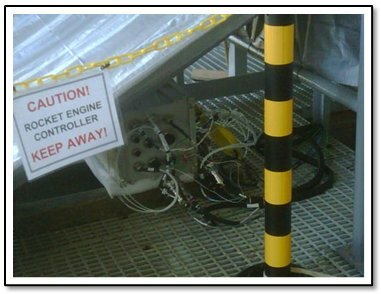 In the picture below what you see is the controller actually sitting on the test stand, on the same level where the engine will be during testing, talking back and forth with the stand. Of course, once the engine arrives, it will have its own controller mounted to the engine itself. This one is just being used for check-outs. Getting all such things checked out and running properly prior to installing the engine is crucial if you harbor any hopes of maintaining your schedule. This is a fine example of PWR and the crews at SSC working together towards a common goal. When an engine is being tested, the area around it is pretty much cleared away. Almost anything close would be swept into the exhaust, or rattled apart, or melted from the heat in the plume. It’s truly a violent environment. But before and after the test, you need to be able to get your hands on the engine for a whole variety of reasons. For example: After a test, the engine needs to be dried. Remember that the combustion product for an oxygen-hydrogen engine is hot steam. When the engine cools after a test, that steam condenses and becomes water. In order to prepare for the next test, we have to dry out all that residual water and we do so by blowing heated gas, dry air or nitrogen, through the engine. So, we need access to the engine to hook up the hoses. In the picture above are shown the lightweight, temporary platforms that have been created to allow for engine access. The engine will reside in the hole in the middle of the platforms. 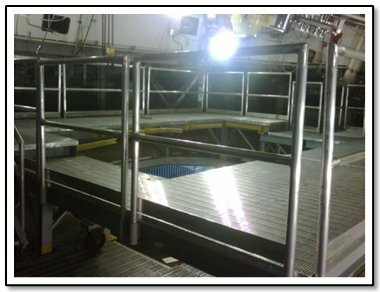 Prior to a test, these platforms are removed and after a test they are erected back in the position shown. Okay, now we’re going to move over to the work being done on test stand A1. This is where we will first be testing the PowerPack Assembly (PPA). The PPA primarily consists of the turbomachinery and the gas-generator. It is essentially a special test bed for the propellant feed and turbine drive functions of the engine. Because the PPA does not have to feed a carefully balanced engine system and because we will be using special test equipment electro-mechanically activated, EMA, valves to control the PPA, we will have the freedom and ability to explore many more operational conditions for the turbomachinery than are possible during actual engine testing. This is a way to truly wring out the design with only a limited number of test articles. We will be calling the upcoming test article PPA2 since we had previously tested a PowerPack Assembly composed of legacy J-2S and XRS-2200 components back in 2007 and 2008. After PPA2 testing, test stand A1 will be converted back to a full engine test facility. Just as we are using an engine controller to check out the communication systems, and just as we have special tooling for finding the right location for the spray ring on test stand A2, a special tool was developed by PWR to help the technicians at SSC properly position all of the plumbing that feeds into the engine. The tool is called a Master Interface Tool (MIT) and it is simply a bunch of fake interfaces all in the correct geometrical locations as though they were the real interfaces for an engine and PPA2. In the picture below, the MIT is the yellow item in the foreground. This portion of the MIT simulates the connections for all of the ancillary lines to the engine besides the main propellant flows. 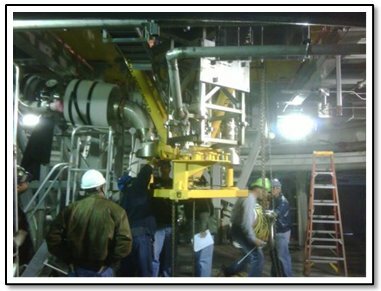 Because the MIT properly emulates the engine, once all of the piping on the test stand side meets up with the tool, the technicians have much greater assurance that when an engine shows up, it will fit into the space provided. This is a much better approach than attempting to locate these lines in space with no solid reference point and it saves time since these lines can be installed now rather than waiting for the engine or the PPA2 to show up on the stand. The MIT appears in the picture below as well. 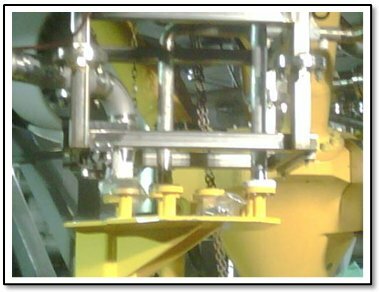 It is the yellow item on the bottom and here it is being used to position the installation of the liquid hydrogen and liquid oxygen feed lines. Thus, when we are actually up and running with an engine, it will hang right where the MIT is currently sitting. The other yellow items in this picture, the beams that appear to extend up and into the rafters, are the structure that carries the thrust of the engine. These four beams will transmit a total of approximately a quarter of a million pounds-force of thrust into the thrust measurement system and into the test stand itself. The last couple of pictures that I wanted to include here is intentionally less ‘glamorous’ than some of the previous ones showing where the engine will sit when tested or big pieces of tooling, etc. These pictures were taken in a couple of corners of the A1 test stand on the deck above where the engine will sit. These are the piping systems that will control and measure what on the vehicle would be the tank pressurization flows coming off the engine. The intended point about these last two pictures is that the facilities necessary to properly test a rocket engine are quite involved and quite complex. The environments are vicious, the tolerances are tight, and everything that goes into or comes out of the engine needs to be controlled and measured. Indeed, the whole reason for doing engine testing is to gather data so as to better understand how well the design works. Work continues. The formal Facility Readiness Reviews for these stands are currently scheduled for early March for test stand A2 and late April for test stand A1.